I don’t care if you’re five years old or sadly waving goodbye to middle age, coloring is the bomb. It’s soothing to get lost in adding vivid color to barren images, and it’s just plain fun. But as the parents among us well know, it can be difficult to find coloring books that aren’t filled with Disney characters or basic boring images. They aren’t exactly exciting for adults to color in (and of course your kids *will* want you to color with them), but they also are really quite formulaic. 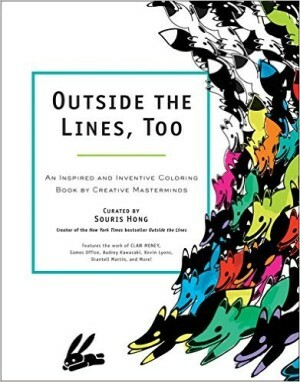 For those of us who want to instill a love of art from a young age (and who just plain want something better to color), Outside the Lines, Too is a perfect solution – so throw away that Sofia the First coloring book and get ready to blast some color onto images from some of the most imaginative artists out there. Artwork aside, Outside the Lines, Too is obviously designed with the user in mind. It’s a nice thick volume that offers tons of images to color (you won’t zip through this one in a weekend, that’s for sure). The pages themselves are made of a thick quality paper that didn’t bleed through, even with markers. Best yet, it’s designed for easy sharing. All of the pages are perforated, so you can easily tear out the pages to hand them out to the group – and they are one sided (the back of each is blank). One page, one image. It completely eliminates the awkwardness of two people trying to color in the same book, and makes it easy to grab just one page for a little coloring therapy break in your day. The images themselves offer quite a variety for your coloring pleasure. Because it is a collection of many different artists, you get to see a nice blend of different art styles, from the complicated to the very simple to some downright weird ones. It’s great, because there is an image to match every mood. Although I will say that there are times that artistic vision doesn’t necessarily lend itself to a good coloring experience, for instance the page showing the arctic is really just drifts of snow – a succinct artistic message it may be, but it just isn’t all that fun to color. For the most part though, the images included in the book are both interesting from an art appreciation standpoint, and a blast to color. Outside The Lines, Too is a great choice for both parents who wish to add a little imagination and appreciation for art to their kids coloring time, and anyone who enjoys a great coloring book (and who doesn’t?). The book itself is printed on high quality paper that holds up well to any coloring option, and the perforated pages make sharing a breeze. Though there are a few of the images that don’t necessarily make for great coloring, for the most part it’s packed with awesome artwork just waiting to be washed in the colors of your choice.